In February, NASA announced it would launch a powerful space telescope in the mid-2020s to map our galaxy and distant universe further and faster than ever before. 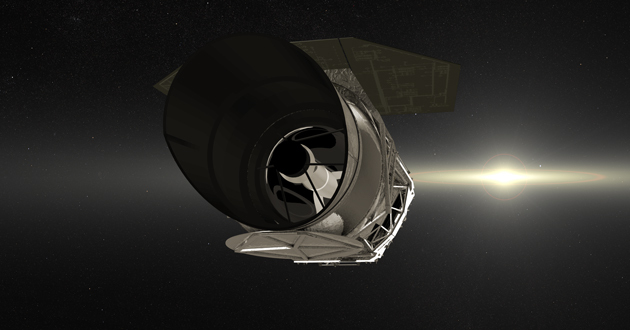 The new Wide Field Infrared Survey Telescope (WFIRST) presents an incredible opportunity to understand fundamental questions about the past, present and future of the universe — and our place in it. Ohio State researchers Scott Gaudi, David Weinberg and Chris Hirata (pictured right) played major roles in developing WFIRST’s current design. In December, NASA appointed all three to WFIRST’s two science investigation teams. For the next five years they will help lead efforts to develop the mission and make preparations for analysis of the extraordinary cosmic maps it will send back to Earth. Their presence on these critical teams gives Ohio State the largest scientific footprint in WFIRST of any university in the country. David Weinberg, professor of astronomy and physics, and astronomy department chair; and Chris Hirata, professor of astronomy and physics, are co-investigators on the Wide-Field Cosmology Team designing WFIRST’s largest program, an enormous map of hundreds of millions of galaxies that will enable measurement of the universe’s growth and the clustering of dark matter. They will design the high-latitude survey, expected to cover an area about 10,000 times larger than the full moon. Their hope is that WFIRST’s measurements will give them a better understanding of why the expansion of the universe is speeding up rather than slowing down. “The cause of this acceleration could be a form of exotic ‘dark energy’ that pervades otherwise empty space. Or, maybe Einstein’s theory of gravity just doesn’t work when we get to distances of billions of light years. Hirata, leading his team’s design assessment, said, “Everything has to be perfect: The simulations. The test data. The temperature to run the telescope. We’re putting a 5-6 ton satellite on top of 700 tons of fuel and accelerating to 35 times the speed of sound. “The cosmological constant hypothesis states that even an empty vacuum (without any matter present) has some gravity, and the amount of that gravity is a new fundamental constant of nature. Astronomy professor and Ohio State’s Thomas Jefferson Professor for Space Exploration and Discovery Scott Gaudi is principal investigator of WFIRST’s Planetary Microlensing Team. It is expected to discover thousands of planetary systems around distant stars, using gravitational microlensing, a search technique pioneered at Ohio State by Gaudi’s mentor Andrew Gould, astronomy professor emeritus. “Everyone wants a sense of purpose — to know why we’re here and where the universe came from,” Gaudi said. “It provides context to our existence. WFIRST is another big step toward answering these questions, driving imagination and hope. Even so, Gaudi has been an extraordinarily skilled extrasolar planet hunter, involved in discovering nearly two dozen. With its wide field of view, its sensitivity to infrared light and the crystal-clear imaging possible only from space, WFIRST should detect thousands of microlensing planets, from gas giants like Jupiter to rocky planets like Earth and Mars. Gaudi is putting several different skill sets to use “to ensure we fulfill our promise to make this happen within the timeframe we set up. In the next decades, WFIRST will certainly push the frontier for astrological and cosmological discovery, but it had immediate impact in Gaudi’s classroom. Most of the researchers’ approximately $2 million in NASA grants will pay their postdoctoral researchers to work on mission design and methods to analyze WFIRST data. All agree it is funding well spent. Four new postdocs join Hirata this fall to work on WFIRST, as well as other projects. “I’m very excited about the people we were able to attract — and they are thrilled to be coming here,” he said. “It’s great to be able to help make WFIRST happen, it’s even better having the opportunity to train the young scientists who will lead the charge when WFIRST is up there a decade from now,” said Weinberg.